I certainly wasn’t prepared for the death of my beautiful mare. We had been companions for more than 10 years competing and pleasure riding and just doing the normal everyday things that one does with their horse. To see that big beautiful majestic animal go down left me with a terrible feeling of emptiness and despair. For weeks I dragged myself through life, not really wanting to be a part of it. My work as a stonemason eventually allowed me to carve out a memorial plaque to remember and celebrate her life. When my daughters and I placed the plaque at her burial site, it gave us some peace and resolution for the loss of our mare that was struck down in her prime. Some time later, friends approached me to make plaques for their deceased animals, for which I was happy to oblige. These events led me to offer my services to all who may be interested in acquiring genuine memorial plaques with engraved black granite and mounted on Sydney sandstone plinth. An enduring and everlasting item to our departed loved one’s. 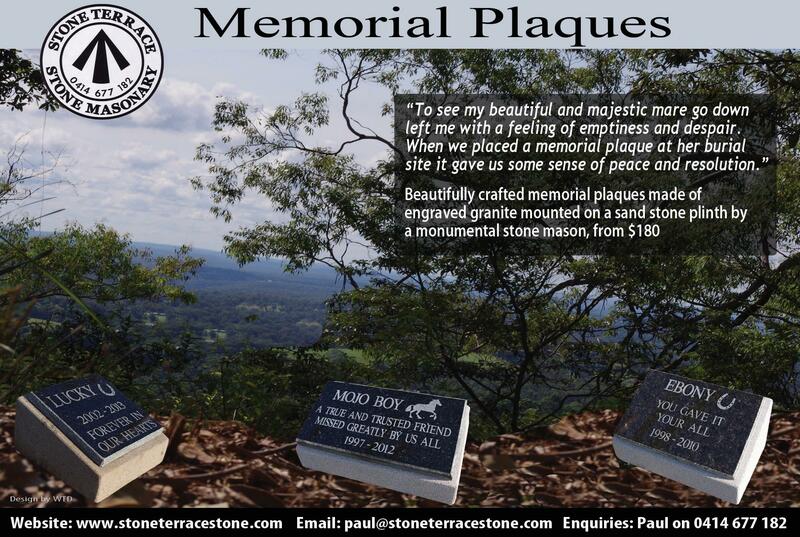 My experience in stone allows me to offer a genuine memorial plaque of superior quality at a reasonable price. The plaques come in three sizes; see below for details, however, we offer a personalised custom design should you require, please call us for further information – Paul 0414 677182.